Peals offer us a great opportunity to try a different method, ring in a different tower maybe, stretch our own ringing ability a little and have some really good time with our friends. Please consider ringing a peal or two for our Guild Festival. “190 peals rung for the Guild during 2014 which is a significant increase on 2013 and the highest total for at least 18 years”. It was laudable that so many ringers scored their first peal during the Central Council’s FirstPeal2015 initiative. Well done “W and P” members!! There are number of occasions in June where a peal would be ideal. …the Queen’s 90th birthday celebrations, the Duke of Edinburgh’s 95th birthday and BBC Music Day. “Come bell ringing. You might enjoy it”, said my friend Paul Sims. It wasn’t the first time I had heard it and I knew it wouldn’t be the last if I didn’t do something about it. So it was on August 13th 2013 that I found myself climbing up the stone staircase to the ringing chamber of St Mary’s church in Great Bedwyn. At the top of the stairs, I was confronted by the smallest doorway I have ever seen. As I bent down to get through, I was reminded of something similar from Alice in Wonderland. Paul introduced me to Dave Haynes the tower captain who took me up to see the bells and explained some simple rules that I should follow i.e. both feet on the floor and don’t touch anything unless I am told to. The ringers then took hold and started ringing. To be honest I still couldn’t see what all the fuss was about – but that was about to change. “Right your turn.” I was told. “Tail stroke first.” I am not sure if it was then or a few pulls later that I knew that bell ringing was for me. I was hooked. They said I made rapid progress for someone my age (59), and within a few weeks, I was just about capable of ringing on my own. Then I read in my parish magazine that they were looking for learners at my local church. So off I went to Shalbourne and it was there that I meet Mike Holt who is tower captain at Collingbourne Ducis and Collingbourne Kingston. He gave me lots of encouragement and nipped a few handling faults I had already acquired in the bud. So from never ringing, I was ringing 3 times a week and making steady progress. 6 months had gone by and I made the decision to start visiting other towers in my area to gain more experience of ringing different bells. It was on one of my outings, I ended up at Kintbury and here I meet Mike and Lucy Hopkins-Till. Mike is joint ringing master at Winchester Cathedral and Lucy has been ringing since she was 8. If asked, she is adamant it has only been 20 years, but I have my suspicions! With their help I made good progress and rang my first quarter peal on August 5th 2014. I was very nervous and by the end I was minus several layers of skin on my hands, but it was worth it and as Mike said, the pain doesn’t last forever. I was then forced to take a couple of breaks from ringing due to surgery on both my hands for carpal tunnel problems. Even though I couldn’t ring, I still studied at home and went to practice nights, as I found that I can learn a lot from just watching others ring. 2015 saw me ring 2 more quarters (no blisters!) and I happened to mention to Mike that I had read that they were looking to get 300 new peal ringers. I said I would like to give it a try and he saw no problems with me attempting it. The beginning of December came and Mike spoke to me and said the peal was on, only the date and time was to be arranged. I wasn’t sure of my feelings at that moment, they were somewhere between cloud nine and Dante’s inferno. I arrived at St Mary’s church, Speen at 9.40. The others arrived at just before 10:00. I already knew Helen Piper and Gill Gardner, having rung with them before. Mike and Lucy were on time, and we made our way up to the tower. We were then joined shortly after by Bruce Purvis. I popped a boiled sweet in to my mouth. This is something I had done before while ringing a quarter peal as it stopped me getting thirsty. I mentioned to my friend Paul that the sweet had lasted the full 45 minutes. His reply was that next time I should try taking off the wrapper! Last thing to do was to take off my watch. Nothing worse than clock watching. We did a few rounds to adjust our rope lengths and then stood. Mike checked we were all ok to go, then we were off. All seemed to be going well until after about 15 minutes there was a hic-cup and we were called to a halt. Undeterred we set off again. I soon got into a good rhythm 123456 654321 123456 654321…… I was getting the hang of this Bob Minor. I was feeling good about it. Of course having no watch, I had no idea of how long we had been ringing. Then Mike called “3 extents to go”, so I realised that we were over half way and I still had a good portion of sweet left! The time seemed to have flown by. I started to feel a little weary and once or twice my handling left a lot to be desired, but then out of the blue Mike called “This is all.” He then called “Stand” and everybody tied their ropes and walked off. I would have done the same, but for the life of me I couldn’t get anything below my waist to move! My legs were locked solid! Only temporary of course (or I would still be there!) and it gave the others a laugh. Next time I must remember to move every so often. I had done it! I had rung a full peal. 3 hours and 5 minutes and not a blister in sight! Looking back I still can’t help feeling amazed at what I had achieved. My thanks go to those that were there that day and for all the nods and winks I received that helped me get to the end. This week’s Ringing World leads with a comprehensive report on FirstPeal2015 – the target smashed, a last minute rush of First Pealers, and our Guild coming out with a respectable total. 2015 was surely the year where Peal Ringing became Cool, there were more First Pealers than in any year since 1991. My hope is that the project will make a lasting difference to our community. We have realised that it IS worth ringing a peal of Plain Bob Minor, because the experience of Peal Ringing can benefit the participants. You can’t overpull for 3 hours, the method becomes engrained in your memory… your confidence as a ringer improves, and never again will a Quarter Peal feel Long!!!! We all strive for good striking, fewer mistakes, and a better overall sound from our bells. Peal Ringing really seems to help. 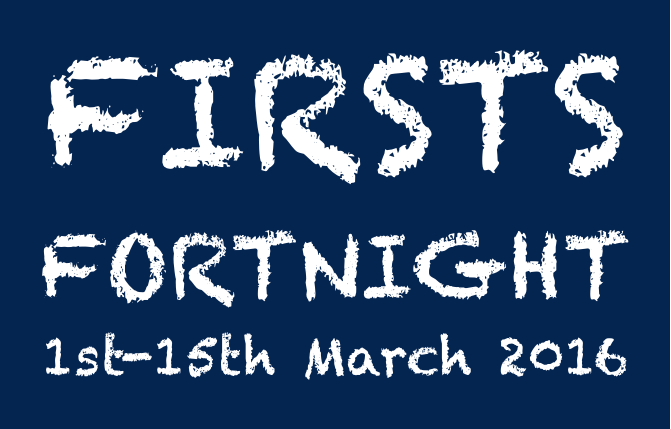 Keep the First Pealers coming through in 2016, especially in Firsts Fortnight (March 1st-15th). Congratualtions Janice Firth, First First Pealer of 2016 in the Guild! Roland has been ringing at Highclere for about three years, scored his first quarter in August 2014, and only 2 more quarters before scoring his first Peal on New Year’s Eve. He is a gentleman of mature years, so his attainment is the more remarkable. He will be elected a full member at the next QDM of the Andover District. He is the 29th and final Guild Member to score a “FisrtPeal2015” marking the tercentenary year of the first recorded peal. First Peal – 1. First of minor – 2 & 4. Viv Nobbs Reports: Happy New Year everyone! So “What gives ringers the buzz?”!!! This program will be a great piece of listening, I’m sure (starts about 3 minutes in) and offers quite an insight to the”First Recorded Peal” – in Norwich.I’m enjoying listening to the start of the article now with my second cup of tea of the day…I’ll get time later to listen to it all later on but, so far, I’m liking the way the radio presentation’s going. It illustrates many aspects of our ringing experience – including the fun and excitement to be had – and actually helps us to see on how to present the world of ringing to would-be recruits perhaps? A good piece of background material to the First Peal 2015 initiative that has been so successful. We can continue to build on it! Matthew Sorell is a member of the CCCBR Public Relations Committee, which was behind the FirstPeal2015 project this year. He posted on Bellringers* this morning asking for feedback on an idea for 2016. 351. The first first-pealer today will take us to the best tally since 1993 (381). 1. 400 first pealers (8/week), with a stretch goal of 500 (10/week). We have been hitting 10/week for nearly 3 months now. While there are some records for these, they are not necessarily reliable so we really don’t have longitudinal data to compare. This means there isn’t really much basis from which to set target figures. However, if we could find a mechanism to keep a fairly reliable tally, we have something to go on for 2017. 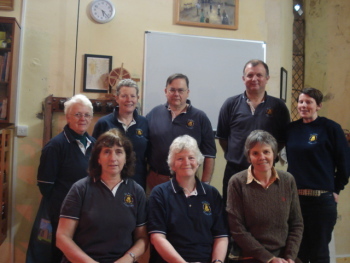 The recognition of ringing “angels” for peals, quarters and service ringing – that is ringers of any experience who support new ringers by being part of the band, has been proposed by MarquisRFS extending the idea of “peal angels” recognised by Andrew Craddock’s pealbase. What I like about this idea is that it raises awareness of what all of us can do to support ringers as they join the Sunday service band and ring early quarters and peals. What do people think of this idea? Thanks to Tony Smith for creating this league Table of how many FirstPeal2015 ringers each District has scored – outstanding work, all those who have contributed to this massive effort! And what is it about Island Life? These totals are very interesting when you compare the sizes of the Districts! The peal was arranged by Michael Church. The ringers are all from St Michael’s Basingstoke. Michael arranged the peal as he and the first pealers were keen to get in on “FirstPeal2015“. The Initial plan was to ring Plain Bob Minor but Rebecca was keen to ring her first peal with her husband Richard who could only reliably cover, hence Doubles. After a nervous start she was fine. Likewise Steve Lutener who was just about rock solid after the first few extents. Rebecca is already enthusiastic about another peal and I have said I would be happy to ring something with her in the new year. 2m: 25 extents of Grandsire and 17 of Plain Bob. First peal – 3, 4, 6. Circled tower to peals – 2. Rung for Christmas and as a farewell to Revd Peter Dyson after 11 years of ministry in Upton Grey. A new list has appeared – this time, of who the FirstPeal2015 “Angels” are. 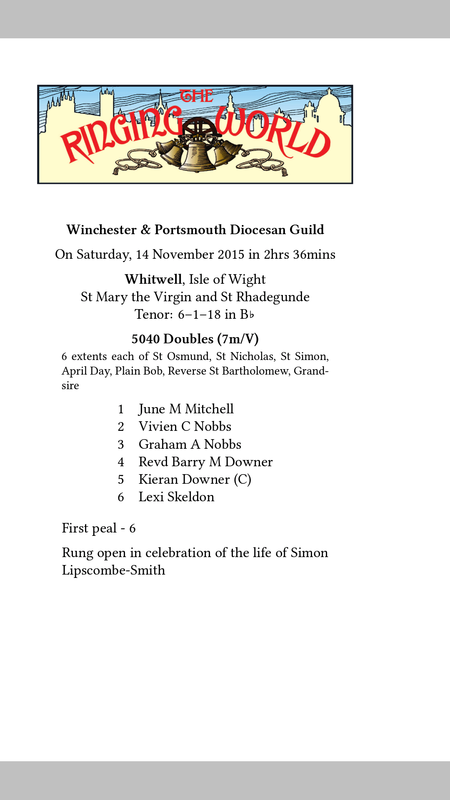 The top Angel is Simon Edwards, who has rung with no fewer than 14 people in their First Peal, at least 4 of those being scored for Winchester and Portsmouth Guild. Second Equal is Angie Jasper (with 9). Angie is based in East Dorset branch (SDGR) but at least 2 of these were scored on our turf! Click to see the full list created by Andrew Craddock. Rather belated congratulations to Charlotte who contributed to the Winchester and Portsmouth FirstPeal2015 efforts back in August. When’s the Second Peal then Charlotte? 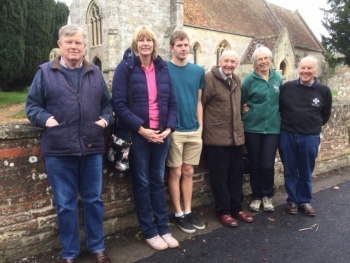 Salisbury Guild have contributed the 300th First Pealer in fine style – the 4 first pealers in the band at Wylye became numbers 300, 301, 302 and 303 in this year’s list of First Pealers on Pealbase . The CCCBR Public Relations Committee first dreamed up the initiativre as a way of marking the 300th Anniversary of the First Recorded Peal, and of encouraging people to take the plunge into Peal Ringing who might not otherwise have done so. The oldest First Pealer in this band was 74 – no excuses then? What will be the total be by the end of 2015? Huge well done to Jon, Clare and Peter on ringing their first peal today! Excellent work, another fantastic achievement for SUGCR! 2016 “Firsts Fortnight” for the Guild. 1st March – 15th March 2016. Please ask your District to consider choosing appropriate categories e.g. first quarter peal, first visit to another tower, first touch called. This gives a specific aim for a ringer and offers the District and Guild an opportunity to recognise individual achievements. The results can be posted on the website, of course. 2016 Guild Peal Festival. June 2016. A natural follow on to the FirstPeal2015 initiative that is going so well. There is a good deal happening that month, so we’re anticipating a variety of footnotes! Let’s see if we can see a significant increase in “W & P” peals next year! South East Region Young Ringers Striking Contest. We’ve been invited by The Guildford Diocesan Guild Young Ringers to enter a team on Saturday 2nd April at Epsom. Details to follow. We will be discussing with a number of ringers who are actively helping young ringers’ groups already with a view to a team entering from our Guild. We have registered an interest. We’ve been asked by The Salisbury Guild to consider a jointly organised ringing and social event, possibly in the summertime of 2016. Again this will be considered and discussed – more details will be made available, as soon as possible. Inter-tower 6 and 8 bell striking contests 21st May A.M. Hosted by the Winchester District, the day will include the Inter-District 8 bell striking contest. Again, efforts are being made to make the day enjoyable and arrangements are being made now. It will be based at New Arlesford (using Cheriton, Titchbourne, Easton as well in the Itchen Valley) to have a range of towers within easy reach. These are mostly 6 bell towers. Congratulations to Judith for ringing your First Peal at the Town Church, Gurnsey. Another Guild First Pealer. Congratulations Lexi Skeldon, Brading Ringer, Isle of Wight. I hope you’ve all had a good summer break and are now settled back into enjoying your regular ringing once again. There are many special occasions that we celebrate with our ringing and we’ve just seen H.M. Queen Elizabeth become our country’s longest reigning monarch. A good deal of ringing took place and it was an excellent opportunity to engage with our church congregations and communities. 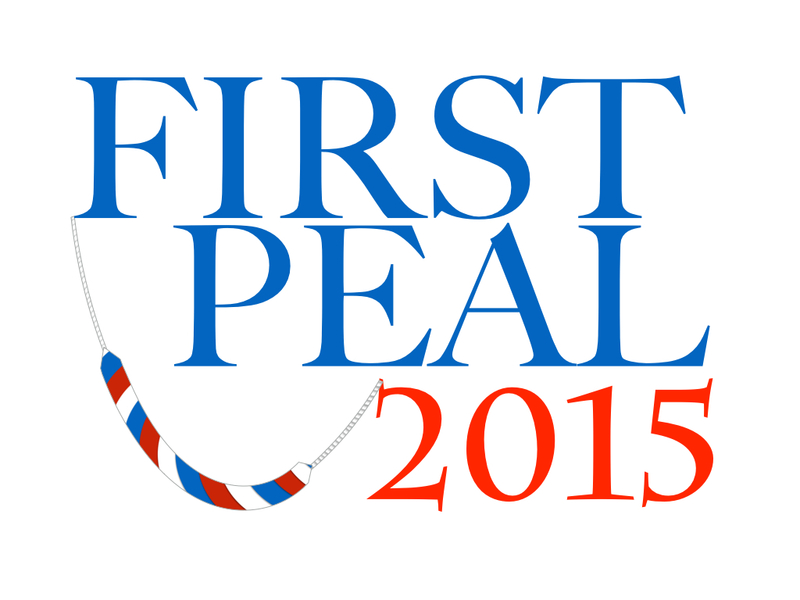 An event from which ringing might well benefit from publicity is the First Peal 2015 initiative. Quite a challenge – aiming for 300 first pealers in a year – but well worth the effort. It’s good to have a target – it helps us focus on achievement. Not only that but, just as in striking contest mode, we can get a great deal of positive teamwork and fun out of the journey towards attaining a particular goal and a great sense of satisfaction when we get there. The W & P has been helping to reach this particular goal – within our Guild area to date, we have had 14 (including one compounding member) “2015 First Pealers”. There was also a peal by the Southampton University Guild with five first pealers and a handbell peal for the “Page 3 Society” on Alderney with one first pealer. I’m keen to encourage more. Please get in touch with me, if you feel we could assist in any way. At the A.G.M. in July, the Action Plan was accepted; thank you. This plan (a summary and full plan are displayed on the Guild website) is very much a work in progress document. We have pledged Guild funds in a genuine attempt to help support Districts and their officers when resources are generally stretched. Please consider taking a look at a few sections that might well benefit you or members in your tower or District. One example is funding for one district initiative each year up to £500 to improve the accessibility of, or the provision of some sort of training scheme. More details on how to apply will be given at the Executive Committee meeting on 21st November. The Belfry Stewardship Committee has held its first meeting – a good deal was achieved and there is much enthusiasm evident there. The new Communications Committee is busy building the new website and in the process of helping to plan for the development of an electronic database. The Education Committee members continue to work hard in providing their splendid courses. The committee meetings are now using modern technology enabling Duncan in Guernsey to attend without travelling out of his front room! We were sorry that the Inter-District 10-bell Striking Contest had to be cancelled. The new committee and the Principal Officers will be working hard to ensure that participation in future contests is encouraged and that plans are made well in advance to ensure that members have plenty of opportunity to reserve the date(s) and to get their practices well underway. The Ringing World National Youth Contest power point presentation by Linda Garton in Bishopstoke was excellent. We are very grateful to Linda and her husband, John Loveless, for giving up their whole day to support our efforts in this way. We are hoping to receive the presentation slides from Linda so that we might be able to pass on the great information to those that were unable to get to meet her on the day. Don’t forget Christmas! You might well have seen by now the 2016 Ringing World Calendars featuring W & P towers – some great photos. They’ll make great presents – see if we can get them sold out! Graham (Fawley) and Mike (until recently also a Fawley ringer) both scored their first peal at the first attempt on Friday 5th June at Fawley. The target across the whole ringing community is for 300 First Pealers to be successful during 2015, to mark the 300th anniversary of the first recorded peal. Peals in C&S District have contributed 9 people towards this total so far, and anyone else wanting to ring a first peal is invited to contact Colin Butler, District Ringing Master. A video of some of the ringing has been posted on the District Facebook Group. Many thanks once again to Simon Edwards who came down from Swindon to conduct the peal. Congratulations are also in order for Daniel Scott (Sacred Heart) who scored his first quarter peal of Surprise Major the previous day, also conducted by Simon Edwards. The last weekend of February saw a busy weekend of ringing at the Western end of the Christchurch and Southampton District including several important firsts. The weekend began with a pleasant quarter peal of Grandsire Doubles on the recently rehung five at Hinton Admiral on Friday evening. This was a first of Grandsire Doubles for Daniel Scott and only his third quarter peal. It also gave Tim Martin the chance to ring his second quarter at Hinton after his first ever quarter there 36 years ago. Saturday morning saw four of the same band heading to Christchurch Priory for a peal attempt. A well struck peal of Minor in three methods was achieved in 2h 53m. The band contained two first Pealers, Rosalind Martin and Daniel Scott at their first attempt and was also the first inside for Jack Pease and to mark his 16th Birthday. Apart from the conductor, Simon Edwards from Swindon, all the band were either members of the Priory band or regulars at the Priory practice night so a good local effort. After a lengthy lunch break three of the band headed out into the New Forest to the recently augmented 6 at Minstead where a well struck quarter of Grandsire Minor contained three firsts of that method inside plus a first of minor. After service ringing on Sunday Morning at Christchurch Priory and Sacred Heart Bournemouth a quarter peal of Stedman Triples was rung on the fine Taylor octave at St Peter’s Bournemouth being the first of Stedman for Rosalind Martin. Finally, another quarter peal of Grandsire Doubles was scored back at the Priory for evensong to enable another of the local band, Aila Peacock to ring her first Grandsire inside. It was also the first time that the Middle six at the Priory have been rung to a peal.